We made this portfolio website for illumé of New York, a boutique store in the decorator district of NYC. 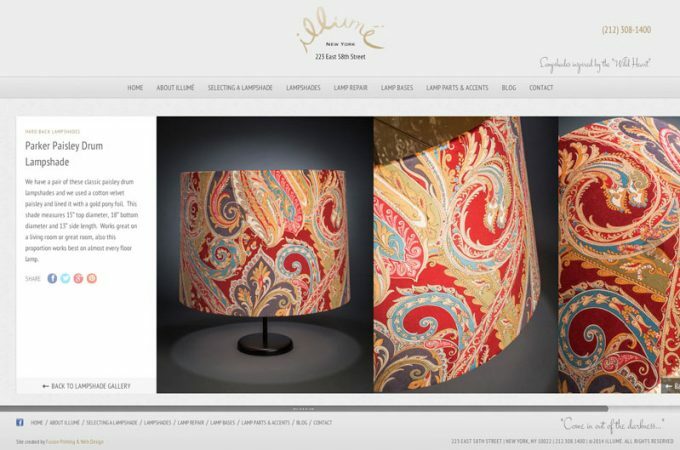 Fusion solved the problem of how to creatively display many beautiful photographs of illumé’s designer lampshade product line. This website showcases product photography in a slick portfolio with Pinterest-like display boards. The products open into a smooth slide-out window without leaving the homepage. Social sharing buttons allow these great lampshade photos visibilty by thousands of viewers.